Copywright Ellen H. Rice, Ocean View, Delaware 2017. All rights reserved. Archival gicle'e prints in several sizes. Custom sizes available. ​The Journey is the second painting in my Strength of Woman Series. 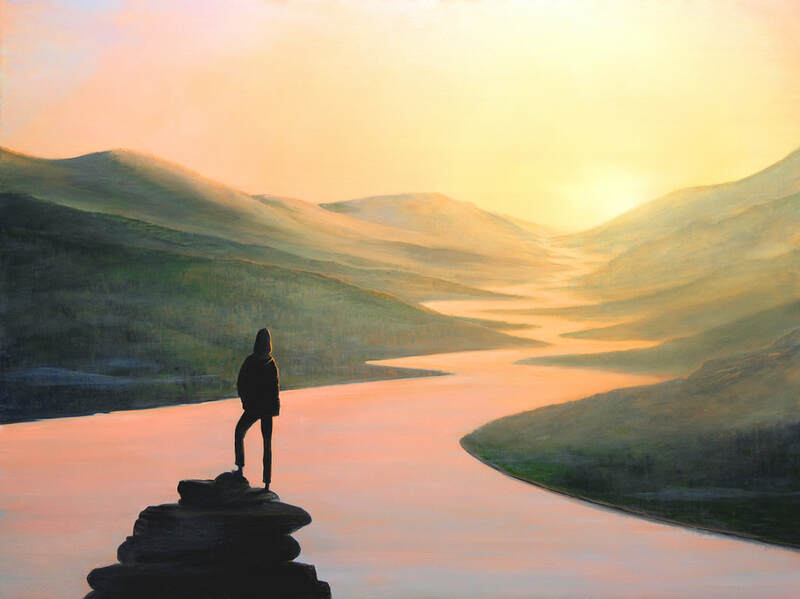 As in the first painting in the series, Standing on the Rock, this painting’s idea came to me as a complete mental picture during a time of prayer, listening. It appeared after 10 straight years of intense life storms had passed and a new view of reality was dawning in my healing consciousness. The image of The Journey seemed a continuum of Standing on the Rock and after seeing the response to that painting, I felt called to paint it. With this series and other paintings that have come to me, I saw the image first, then I put my thoughts down. The Journey may mean something entirely different to you, and that is just as it should be. Instead of facing a broiling sea, she is gazing calmly into the sun as it begins to disappear behind a distant mountain range. She has journeyed far, her standpoint has changed and her new perspective is reflected in everything she sees and experiences. She is sure-footed on her rocky pinnacle, relaxed, for she has arrived at a place of understanding – a place where she no longer sees life as ups and downs, peaks and valleys, successes and failures, but as a continuous journey. Before her lies a large, serene river winding its way through the valley below, reflecting the sun’s brilliant glow. And just as the calm surface of the river mirrors the sun’s light, the woman’s life calmly reflects light in all her ways as she bases her life in truth and walks in trust. May you discover within yourself your own place of understanding. It is in calmness – absolute trust – that we find our greatest strength, and it is in trust that our path is lit before us.